Nashville, Tenn. (Jul. 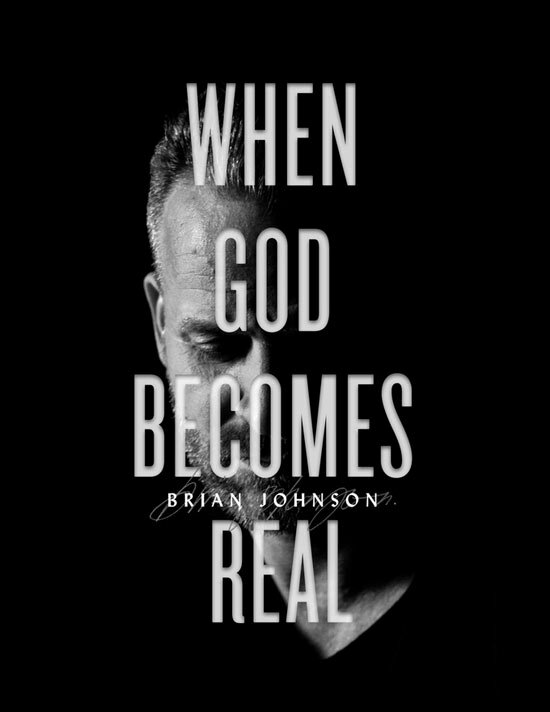 16, 2018) - Opening with a panic-filled breakdown that rattled him for six months in 2015, Brian Johnson’s new book When God Becomes Real (Nov. 13) journeys readers through the darkest times of his life as he battled depression and anxiety head-on. The personal book draws back to the origins of his relationship with God and the fear that riddled him throughout parts of his youth. The husband and father of four dives into breaking strongholds when life’s pace became expedited and the tolling pressures became too much to bear. "When God Becomes Real is my journey out of the darkest moments of my life when I thought I’d never escape the anxiety and panic that consumed my life. But God did what only He can do and brought me through it with more hope and promise than I’ve ever had," shares Johnson. "I know He can do the same for everyone so that you can experience what happens when God becomes real in your own life." Having penned well-known Bethel Music hits such as “One Thing Remains,” “We Will Not Be Shaken” and “No Longer Slaves,” When God Becomes Real offers glimpses of the formation of the songwriting and collaborators which have sense stemmed into Bethel Music. Johnson spearheaded the creation of Bethel Music in 2007 which has led to multiple no. 1 albums, including many with his wife Jenn Johnson. When God Becomes Real also shares the personal side of Johnson sharing about his upbringing, family and home life. Pre-order When God Becomes Real here, and get an immediate download of the first chapter. Brian & Jenn Johnson are co-founders of Bethel Music, WorshipU and have been integral in the production of more than 15 albums that have influenced the culture of worship across the global church. Brian facilitates an atmosphere of faith in worship and has written anthems such as “Living Hope,”"Have it All", "We Will Not Be Shaken" and "One Thing Remains," which was awarded No. 1 song for ASCAP Christian Music and No. 1 Radio Single in 2013. Johnson’s newest, chart-topping solo album, After All These Years, released in January 2017 alongside his wife Jenn. They are committed to raising healthy family, cultivating community and fostering unity among worship leaders from around the world. Together they are passionate about raising up worshippers who take hold of their true identity and pursue intimacy with God above all else. Brian and Jenn reside in Redding, California, with their four wonderful children.